Your face can be on it, if you GiveAShit. Excrement! A giant squatting man has been erected outside the offices of the London mayor in a bid to raise "awareness" of the toilet. 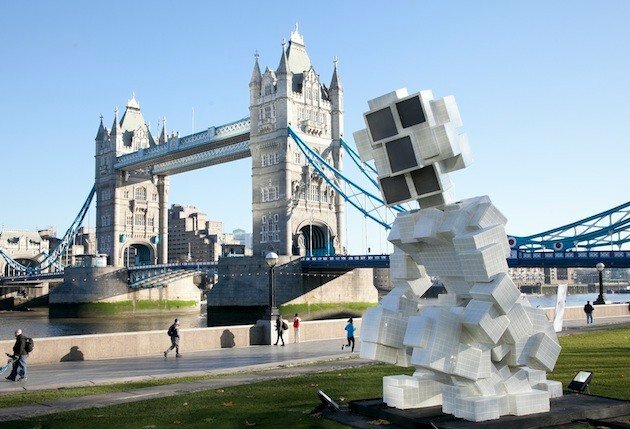 The 5-metre high squatting figure next to London's Tower Bridge turns its head to look at passersby and on its face - comprising four large screens - the bending statue hosts photos of members of the public. People who want to be seen giving a crap can sign up via Facebook and do their bit for the loo. A stunt for "breaking the taboo around toilets" and raising awareness of sanitation, the statue will remain on Boris Johnson's front lawn for the duration of World Toilet Week this week, from 17 to 21 November. It's not a realistic depiction of a pooing man, looking more like a glued-together selection of white Rubix cubes, but the technical achievement of the Public Toilet statue is to pull in crowd-sourced images of members of the public. If you like, you can go and look at the statue at the time when your face will be displayed on it. Alternatively, you can watch the passersby looking at it on the live webcam. Sign up over on Facebook here. You can't suggest another person, sadly. Boris, on his official Twitter account at least, has made no remark on the statue.